Magha Puja, also called Sangha Day or Fourfold Assembly Day, is a major uposatha or holy day observed by most Threravada Buddhists on the first full moon day of the third lunar month, usually sometime in February or March. The Pali word sangha (in Sanskrit, samgha) means "community" or "assembly," and in this case, it refers to the community of Buddhists. In Asia the word usually is used to refer to monastic communities, although it can refer to all Buddhists, lay or monastic. 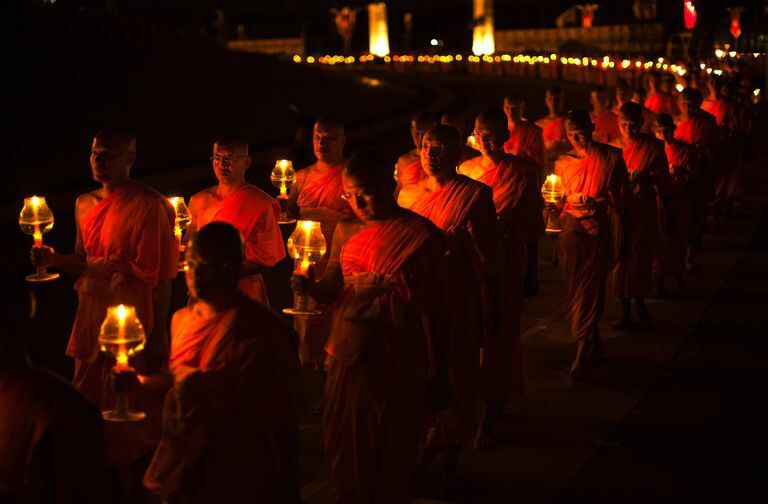 Magha Puja is called “Sangha Day” because it is a day to show appreciation to the monastic sangha. "Fourfold assembly" refers to all followers of the Buddha -- monks, nuns, and men and women who are lay disciples. On this day laypeople gather at temples, usually in the morning, bringing with them offerings of food and other items for the monks or nuns. Monastics chant the Ovada-Patimokkha Gatha, which is a summary of the Buddha's teachings. In the evening, often there will be solemn candlelight processions. Monastics and laypeople walk around a shrine or Buddha image or through a temple three times, once for each of the Three Jewels – The Buddha, the Dharma, and the Sangha. The day is called Makha Bucha in Thailand, Meak Bochea in Khmer and the full moon of Tabodwe or Tabaung in Burma (Myanmar). All the monks were arhats. All the monks had been ordained by the Buddha. It was the full moon day of Magha (the third lunar month). When the monks were assembled, the Buddha delivered a sermon called the Ovada Patimokkha in which he asked the monks to do good, to abstain from bad action, and to purify the mind. One of the most elaborate Magha Puja observances is held at the Shwedagon Pagoda in Yangon, Burma. The observance begins with offerings to the 28 Buddhas, including Gautama Buddha, who Theravada Buddhists believe lived in prior ages. This is followed by a nonstop recital of the Pathana, Buddhist teachings on the twenty-four causes of worldly phenomena as taught in the Pali Abhidhamma. This recital takes ten days. In 1851, King Rama IV of Thailand ordered that a Magha Puja ceremony be held every year forever at Wat Phra Kaew, The Temple of the Emerald Buddha, in Bangkok. To this day a special closed service is held every year in the main chapel for the Thai royal family, and tourists and the public are encouraged to go elsewhere. Fortunately, there are several other beautiful temples in Bangkok in which one may observe Magha Puja. These include Wat Pho, the temple of the giant reclining Buddha, and the splendid Wat Benchamabophit, the Marble Temple.